There's a lot more to discover about Iceland than just epic landscapes. But although Iceland well known for its literature I for one did not pay too much attention to icelandic sagas – at least not until we had photographed a lava field called Berserkjahraun. After a long day of driving alongside seemingly endless fjords we were looking forward to dining at one of the restaurants in Stykkishólmur that were praised by our travel guide. We had already taken the turnoff when I looked to the sky (can't help doing that close to sunset) and saw that something was about to happen. Although we were starving at that time we decided to give it a shot and made a u-turn. We continued along the main road around Snæfellsnes peninsula looking for something of interest. There was no time left for scouting, but the name Beserkjahraun (literally "berserkers lava field") sounded intriguing and we decided to go there to find us a nice spot. We soon reached a small hill overlooking the lava field all the way to the distant Bjarnarhafnarfjall mountain. 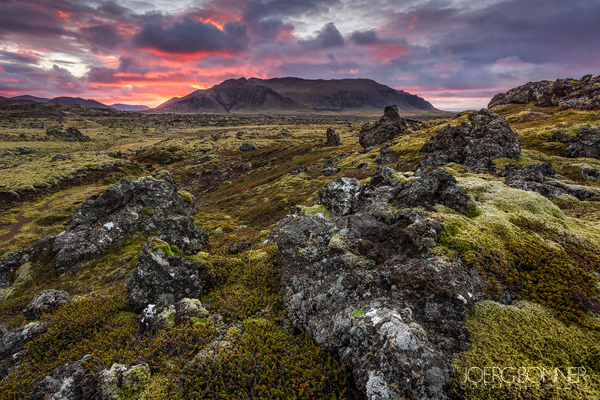 Green moss and black lava stones in the foreground complemented by dark clouds illuminated in orange provided a first class photographic opportunity. Unfortunately the show didn't last too long but I was able to capture a few different compositions of which I prefered the one shown below. I liked the centered, symmetric shape of the distant mountain backed by the glowing clouds. The name Berserkjahraun originates from the Eyrbyggja saga. A farmer had brought two berserkers (norse warriors known for battling in a furious frenzy) to Iceland's Snæfellsnes peninsula. Since he had problems handling the two he gave them to his brother Víga-Styrr, who was living on the other side of a 3-4.000 year old lava field. After a while one of the berserkers fell in love with his daughter and to his discontent asked for her hand. Víga-Styrr promised to agree under the condition that the berserkers cleared a path through the lava field to connect his farm with the nearest settlement. The two soon finished what Víga-Styrr thought was impossible, but instead of rewarding the berserkers he treacherously murdered both of them and buried them somewhere along the path. The great Icelandic sagas are some of the most underrated treasures of world literature. I haven't read Eyrbyggja, but scenes from Njal's, Laxdaela and Egil's are always in my mind when I look at landscape photography from Iceland. Beautiful photo, Joerg, and it makes an excellent illustration of a typically haunting Icelandic story. my visit to berserkjahraun was a real eye-opener for me regarding the mystic world of icelandic sagas! i haven't found the time to read more than a few excerpts, but i would really love to!